Harrisburg’s Midtown Scholar Bookstore treated fans to an intimate show with Brad Yoder. Guests enjoyed the ambiance of sipping coffee from hand made mugs amongst the stacks of vintage books. It was akin to hearing a concert while comfortably lounging in your living room except for the soaring ceilings and awesome acoustics. Brad Yoder is well known to Pittsburgh coffeehouse audiences. His quirky poetry set to pop tunes lends itself nicely to an acoustic performance. The only instruments tonight are Brad’s versatile voice and his guitar. He sounds as though he’d be just as comfortable singing children’s songs as the pop/folk he is performing today. Early in the first set, Brad plays a song he wrote for a songwriting contest sponsored by Paul Lloyd. The song is called, “I Was a Terrible Waiter”. The lyrics are fun and delivered with a bit of self deprecating humor, “…Yeah, I was the guy the boss would’ve fired if he could’ve found a monkey who would take my place…,” We didn’t know it at the time, but we were listening to the contest winner! Brad Yoder’s songs range from light-hearted fun like “Hair Loss Blues”, “…it’s a tragedy, if you know what I mean, I was born Mr. Yoder, I’ve become Mr. Clean…,” and “Lite Brite” which brings back memories of a favorite childhood game ( another songwriting contest gem) to poetry set to a breathtakingly beautiful melody in “School Together”, “…everything will fall into place, someday or never, it hardly matters, when forever comes apart, I’ll gather pieces of my scattered heart…,” and stories like the fan favorite, “Skyler”. Brad explains during the show that “Skyler” is a true story and his most frequently requested song. He adds that he is happy to play any song for us – as long as he wrote it. 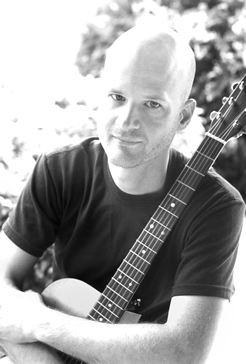 Brad Yoder released his first CD, Best Sunday Heart in 1997 and followed it up with the live CD, Talk to Total Strangers in 1999, Used in 2002 and Someday Or Never in 2007. You can purchase copies of these CD’s or listen to the songs on Brad’s super cool website. Be on the lookout for when Brad Yoder stops in your town. It is a performance you won’t want to miss! NOTE: Brad Yoder donated the song “Any Day” to the Dollars for Diane compilation album.